It takes a rich and diverse set of complex molecules for things like stars, galaxies, planets and lifeforms like us to exist. But before humans and all the complex molecules we’re made of could exist, there had to be that first primordial molecule that started a long chain of chemical events that led to everything you see around you today. Though it’s been long theorized to exist, the lack of observational evidence for that molecule was problematic for scientists. Now they’ve found it and those scientists can rest easy. Their predictive theory wins! It allowed us to spot auroras on Saturn and planets orbiting distant suns. It permitted astronomers to see galaxies in the early stages of formation, and look back to some of the earliest periods in the Universe. It also measured the distances to Cepheid variable stars more accurately than ever before, which helped astrophysicists constrain how fast the Universe is expanding (the Hubble Constant). It did all of this and more, which is why no space telescope is as recognized and revered as the Hubble Space Telescope. And while it’s mission is currently scheduled to end in 2021, Hubble is still breaking new ground. Thanks to the efforts of a research team from the Instituto de Astrofísica de Canarias (IAC), Hubble recently obtained the deepest images of the Universe ever taken from space. According to the Big Bang Theory of cosmology, the Universe began roughly 13.8 billion years ago as all matter in the Universe began to expand from a single point of infinite density. Over the next few billion years, the fundamental forces of the Universe began to separate from each other and subatomic particles and atoms formed. In time, this first stars and galaxies formed, giving rise to the large-scale structure of the Universe. However, it was only by roughly 1 billion years after the Big Bang that the Universe began to become transparent. By about 12 billion years ago, intergalactic space was filled with gas that was much less transparent than it is now, with variations from place to place. To address why this was, a team of astronomers recently used the world’s largest telescope to search for galaxies of young stars in a huge volume of space. The study which details their findings recently appeared in The Astrophysical Journal under the title “Evidence for Large-scale Fluctuations in the Metagalactic Ionizing Background Near Redshift Six“. The study was led by George D. Becker, a professor of astrophysics at the University of California Riverside, and included members from the University of California, Los Angeles (UCLA), and the University of California, Santa Barbara (UCSB). For the sake of their study, the team used the Subaru Telescope – the world’s largest telescope, located at the Mauna Kea Observatories in Hawaii – to examine a 500 million light-year volume of space as it existed roughly 12 billion years ago. Using this data, the team considered two possible models that could account for the variations in transparency that astronomers have been seeing during this cosmic epoch. On the one hand, if the region contained a small number of galaxies, the team would conclude that startlight could not penetrate very far through the intergalactic gas. On the other hand, if it contained an unusually large number of galaxies, this would indicate that the region had cooled significantly over the previous several hundred million years. Prior to their observations, Beck and his team were expecting to find that it was the latter. In addition to addressing an enduring mystery in astronomy, this study also has implications for our understanding of how the Universe evolved over time. According to our current cosmological models, the period that took place roughly 380,000 t0 150 million years after the Big Bang is known as the “Dark Ages”. Most of the photons in the Universe were interacting with electrons and protons at this time, which means radiation from this period is undetectable by our current instruments. However, by about 1 billion years after the Big Bang, the first stars and galaxies had formed. It is further believed that ultraviolet light from these first galaxies filled the Universe and is what allowed for the gas in deep space to become transparent. This would have occurred earlier in regions with more galaxies, the astronomers concluded, hence why there are variations in transparency. In short, if more ultraviolet radiation from galaxies would lead to greater transparency in the early Universe, then the existence of fewer nearby galaxies would cause certain regions to be murkier. In the future, Becker and his team hope to further study this region of space and others like it in the hope that it will reveal clues about how the first galaxies illuminated the Universe during that early period, which remains a subject of inquiry at this point. This research is also expected to shed more light on how the early Universe evolved, gradually giving rise to the one that are familiar with today. And as next-generation instruments are able to probe deeper into space (and hence, further back in time), we just may come to understand how existence as we know it all unfolded. In 1990, the Hubble Space Telescope was placed into Low Earth Orbit. Since then, Hubble has gone on to become the most well-known space observatory and has revealed some never-before-seen things about our Universe. Despite the subsequent deployment of several flagship telescopes – like the Kepler Space Telescope, the Chandra X-ray Observatory and the Spitzer Space Telescope – Hubble is still accomplishing some amazing feats. For instance, a team of astronomers recently used Hubble to locate the most distant star ever discovered. This hot blue star, which was located in a galaxy cluster, existed just 4.4 billion years after the Big Bang. The discovery of this star is expected to provide new insights into the formation and evolution of stars and galaxy clusters during the early Universe, as well as the nature of dark matter itself. The discovery was made by an international team of scientists led by Patrick Kelly (of the University of Minnesota), Jose Diego (of the Instituto de Física de Cantabria in Spain) and Steven Rodney (of the University of South Carolina). Together, they observed the distant star in the galaxy cluster MACS J1149-2223 in April 2016 while studying the supernova explosion known as heic1525 (aka. Refsdal). The light observed from this star – named Lensed Star 1 (LS1) – was emitted just 4.4 billion years after the Big Bang (when the Universe was just 30% of its current age). The light was only detectable thanks to the microlensing effect caused by mass of the galaxy cluster and a compact object about three times the mass of our Sun within the galaxy itself. This allowed for the light coming from the star to be magnified by a factor of 2000. After finding the star in their survey, the team used Hubble again to obtain spectra from LS1 and determined that it is a B-type supergiant star – an extremely bright and blue class of star that has several times the mass of our Sun and is more than twice as hot. Given the star’s age, the discovery of LS1 is find on its own. At the same time, the discovery of this star will allow astronomers to gain new insights into the galaxy cluster itself. As Steven Rodney indicated, “We know that the microlensing was caused by either a star, a neutron star, or a stellar-mass black hole.” As such, the discovery of LS1 will allow astronomers to study these objects (the latter of which are invisible) and estimate how many of them exist within this galaxy cluster. With the deployment of next-generation telescopes – like the James Webb Space Telescope – astronomers hope to learn even more about the earliest stars in the Universe. In so doing, they will be able to learn more about how it evolved over the past 10 billion years or so, and gain vital clues as to how dark matter played a role. In the meantime, Hubble still plays an all-important role in expanding our understanding of the cosmos. When the James Webb Space Telescope takes to space, some tremendous scientific discoveries are expected to result. As the spiritual and scientific successor to the Hubble, Spitzer, and Kepler Space Telescopes, this space observatory will use its advanced suite of infrared instruments to the look back at the early Universe, study the Solar System, and help characterize extra-solar planets. Unfortunately, the launch of this mission has been delayed several times now, with the launch date now set for some time in 2019. And based on the amount of work NASA needs to do complete the JWST before launch, the Government Accountability Office (GAO) believes that more delays are coming and believes that the project is likely to exceed the cost cap set by Congress in 2011 at $8 billion. Part of the problem is that all the remaining schedule reserve – the extra time set aside in the event of delays or unforeseen risks – was recently used to address technical issues. These include the “anomalous readings” detected from the telescope during vibration testing back in December 2016. NASA responded to this by giving the project up to 4 months of schedule reserve by extending the launch window. 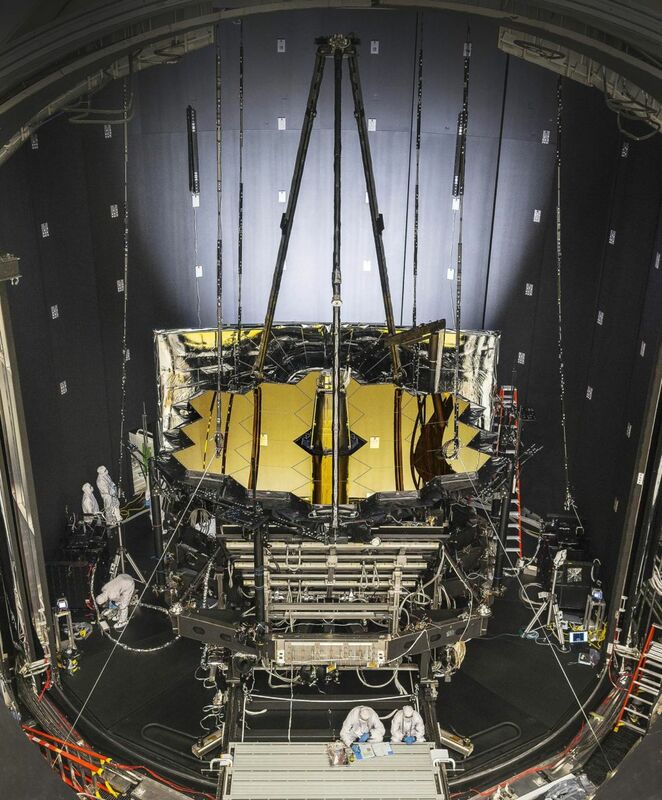 The JWST sunshield being unfolded in the clean room at Northrop Grumman Aerospace Systems in Redondo Beach, California. Credits: Northrop Grumman Corp. Given the remaining integration and test work that lies ahead, more delays are expected. According to the GAO, it is this phase where problems are most likely to be found and schedules revised. Coupled with the fact that only 1.5 months of schedule reserves remain until the end of the launch window, they anticipate that additional launch delays are likely, which will also require budget increases. Initially, the budget estimates that were set by Congress indicated that the observatory would cost $1.6 billion and would launch by 2011, with an overall cost cap set at $8 billion. However, NASA has revised the budget multiple times since then (in conjunction with the multiple delays) and estimates that the budget for a 2019 launch window would now be $8.8 billion. Once deployed, the JWST will be the most powerful space telescope ever built and will serve thousands of astronomers worldwide. As a collaborative project between NASA, the European Space Agency (ESA), and the Canadian Space Agency (CSA), it also representative of the new era of international cooperation. But by far, the most impressive thing about this mission is the scientific discoveries it is expected to make. It’s 6.5 meter (21-foot) infrared-optimized telescopes will search to a distance of over 13 billion light years, allowing it to study the first stars and galaxies that formed. It will also allow astronomers to study the atmospheres of Solar Planets and exoplanets and other objects within our Solar System. As such, and delays and cost overruns in the project are cause for concern. In the meantime, the project’s Standing Review Board will conduct an independent review in early 2018 to determine if the June 2019 launch window can still be met. With so many experiments and surveys planned for the telescope, it would be no exaggeration to say that a lot is riding on its successful completion and deployment. Best of luck passing review James Webb Space Telescope! It is a well known fact among astronomers and cosmologists that the farther into the Universe you look, the further back in time you are seeing. And the closer astronomers are able to see to the Big Bang, which took place 13.8 billion years ago, the more interesting the discoveries tend to become. It is these finds that teach us the most about the earliest periods of the Universe and its subsequent evolution. For instance, scientists using the Wide-field Infrared Survey Explorer (WISE) and the Magellan Telescopes recently observed the earliest Supermassive Black Hole (SMBH) to date. According to the discovery team’s study, this black hole is roughly 800 million times the mass of our Sun and is located more than 13 billion light years from Earth. This makes it the most distant, and youngest, SMBH observed to date. The study, titled “An 800-million-solar-mass black hole in a significantly neutral Universe at a redshift of 7.5“, recently appeared in the journal Nature. Led by Eduardo Bañados, a researcher from the Carnegie Institution for Science, the team included members from NASA’s Jet Propulsion Laboratory, the Max Planck Institute for Astronomy, the Kavli Institute for Astronomy and Astrophysics, the Las Cumbres Observatory, and multiple universities. As with other SMBHs, this particular discovery (designated J1342+0928) is a quasar, a class of super bright objects that consist of a black hole accreting matter at the center of a massive galaxy. The object was discovered during the course of a survey for distant objects, which combined infrared data from the WISE mission with ground-based surveys. The team then followed up with data from the Carnegie Observatory’s Magellan telescopes in Chile. As with all distant cosmological objects, J1342+0928’s distance was determined by measuring its redshift. By measuring how much the wavelength of an object’s light is stretched by the expansion of the Universe before it reaches Earth, astronomers are able to determine how far it had to travel to get here. In this case, the quasar had a redshift of 7.54, which means that it took more than 13 billion years for its light to reach us. Essentially, this quasar existed at a time when the Universe was just beginning to emerge from what cosmologists call the “Dark Ages”. During this period, which began roughly 380,000 years to 150 million years after the Big Bang, most of the photons in the Universe were interacting with electrons and protons. As a result, the radiation of this period is undetectable by our current instruments – hence the name. The Universe remained in this state, without any luminous sources, until gravity condensed matter into the first stars and galaxies. This period is known as the “Reinozation Epoch”, which lasted from 150 million to 1 billion years after the Big Bang and was characterized by the first stars, galaxies and quasars forming. It is so-named because the energy released by these ancient galaxies caused the neutral hydrogen of the Universe to get excited and ionize. Once the Universe became reionzed, photons could travel freely throughout space and the Universe officially became transparent to light. This is what makes the discovery of this quasar so interesting. As the team observed, much of the hydrogen surrounding it is neutral, which means it is not only the most distant quasar ever observed, but also the only example of a quasar that existed before the Universe became reionized. In other words, J1342+0928 existed during a major transition period for the Universe, which happens to be one of the current frontiers of astrophysics. As if this wasn’t enough, the team was also confounded by the object’s mass. For a black hole to have become so massive during this early period of the Universe, there would have to be special conditions to allow for such rapid growth. A billion years after the big bang, hydrogen atoms were mysteriously torn apart into a soup of ions. Credit: NASA/ESA/A. Felid (STScI)). These next-generation missions include the European Space Agency’s Euclid mission and NASA’s Wide-field Infrared Survey Telescope (WFIRST). Whereas Euclid will study objects located 10 billion years in the past in order to measure how dark energy influenced cosmic evolution, WFIRST will perform wide-field near-infrared surveys to measure the light coming from a billion galaxies. Both missions are expected to reveal more objects like J1342+0928. At present, scientists predict that there are only 20 to 100 quasars as bright and as distant as J1342+0928 in the sky. As such, they were most pleased with this discovery, which is expected to provide us with fundamental information about the Universe when it was only 5% of its current age. 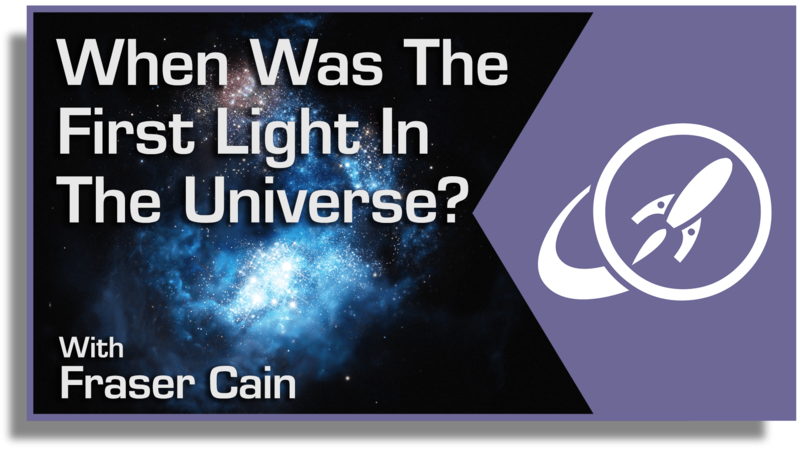 When Was the First Light in the Universe? The speed of light gives us an amazing tool for studying the Universe. Because light only travels a mere 300,000 kilometers per second, when we see distant objects, we’re looking back in time. You’re not seeing the Sun as it is today, you’re seeing an 8 minute old Sun. You’re seeing 642 year-old Betelgeuse. 2.5 million year-old Andromeda. In fact, you can keep doing this, looking further out, and deeper into time. Since the Universe is expanding today, it was closer in the past. Run the Universe clock backwards, right to the beginning, and you get to a place that was hotter and denser than it is today. So dense that the entire Universe shortly after the Big Bang was just a soup of protons, neutrons and electrons, with nothing holding them together. In fact, once it expanded and cooled down a bit, the entire Universe was merely as hot and as dense as the core of a star like our Sun. It was cool enough for ionized atoms of hydrogen to form. Because the Universe has the conditions of the core of a star, it had the temperature and pressure to actually fuse hydrogen into helium and other heavier elements. Based on the ratio of those elements we see in the Universe today: 74% hydrogen, 25% helium and 1% miscellaneous, we know how long the Universe was in this “whole Universe is a star” condition. It lasted about 17 minutes. From 3 minutes after the Big Bang until about 20 minutes after the Big Bang. In those few, short moments, clowns gathered all the helium they would ever need to haunt us with a lifetime of balloon animals. The fusion process generates photons of gamma radiation. In the core of our Sun, these photons bounce from atom to atom, eventually making their way out of the core, through the Sun’s radiative zone, and eventually out into space. This process can take tens of thousands of years. But in the early Universe, there was nowhere for these primordial photons of gamma radiation to go. Everywhere was more hot, dense Universe. The Universe was continuing to expand, and finally, just a few hundred thousand years after the Big Bang, the Universe was finally cool enough for these atoms of hydrogen and helium to attract free electrons, turning them into neutral atoms. This was the moment of first light in the Universe, between 240,000 and 300,000 years after the Big Bang, known as the Era of Recombination. The first time that photons could rest for a second, attached as electrons to atoms. It was at this point that the Universe went from being totally opaque, to transparent. And this is the earliest possible light that astronomers can see. Go ahead, say it with me: the Cosmic Microwave Background Radiation. Because the Universe has been expanding over the 13.8 billion years from then until now, the those earliest photons were stretched out, or red-shifted, from ultraviolet and visible light into the microwave end of the spectrum. If you could see the Universe with microwave eyes, you’d see that first blast of radiation in all directions. The Universe celebrating its existence. After that first blast of light, everything was dark, there were no stars or galaxies, just enormous amounts of these primordial elements. At the beginning of these dark ages, the temperature of the entire Universe was about 4000 kelvin. Compare that with the 2.7 kelvin we see today. By the end of the dark ages, 150 million years later, the temperature was a more reasonable 60 kelvin. For the next 850 million years or so, these elements came together into monster stars of pure hydrogen and helium. Without heavier elements, they were free to form stars with dozens or even hundreds of times the mass of our own Sun. These are the Population III stars, or the first stars, and we don’t have telescopes powerful enough to see them yet. Astronomers indirectly estimate that those first stars formed about 560 million years after the Big Bang. Then, those first stars exploded as supernovae, more massive stars formed and they detonated as well. It’s seriously difficult to imagine what that time must have looked like, with stars going off like fireworks. But we know it was so common and so violent that it lit up the whole Universe in an era called reionization. Most of the Universe was hot plasma. Scientists have used ESO’s Very Large Telescope to probe the early Universe at several different times as it was becoming transparent to ultraviolet light. This brief but dramatic phase in cosmic history — known as reionisation — occurred around 13 billion years ago. The early Universe was hot and awful, and there weren’t a lot of the heavier elements that life as we know it depends on. Just think about it. You can’t get oxygen without fusion in a star, even multiple generations. Our own Solar System is the result of several generations of supernovae that exploded, seeding our region with heavier and heavier elements. As I mentioned earlier in the article, the Universe cooled from 4000 kelvin down to 60 kelvin. About 10 million years after the Big Bang, the temperature of the Universe was 100 C, the boiling point of water. And then 7 million years later, it was down to 0 C, the freezing point of water. This has led astronomers to theorize that for about 7 million years, liquid water was present across the Universe… everywhere. And wherever we find liquid water on Earth, we find life. So it’s possible, possible that primitive life could have formed with the Universe was just 10 million years old. The physicist Avi Loeb calls this the habitable Epoch of the Universe. No evidence, but it’s a pretty cool idea to think about. I always find it absolutely mind bending to think that all around us in every direction is the first light from the Universe. It’s taken 13.8 billion years to reach us, and although we need microwave eyes to actually see it, it’s there, everywhere. In about 4 billion years, scientists estimate that the Andromeda and the Milky Way galaxies are expected to collide, based on data from the Hubble Space Telescope. And when they merge, they will give rise to a super-galaxy that some are already calling Milkomeda or Milkdromeda (I know, awful isn’t it?) While this may sound like a cataclysmic event, these sorts of galactic collisions are quite common on a cosmic timescale. As an international group of researchers from Japan and California have found, galactic “hookups” were quite common during the early universe. Using data from the Hubble Space Telescope and the Subaru Telescope at in Mauna Kea, Hawaii, they have discovered that 1.2 billion years after the Big Bang, galactic clumps grew to become large galaxies by merging. As part of the Hubble Space Telescope (HST) “Cosmic Evolution Survey (COSMOS)”, this information could tell us a great about the formation of the early universe. Last week, astronomers at Yale University reported seeing something unusual: a seemingly stedfast beacon from the far reaches of the Universe went quiet. This relic light source, a quasar located in the region of our sky known as the celestial equator, unexpectedly became 6-7 times dimmer over the first decade of the 21st century. Thanks to this dramatic change in luminosity, astronomers now have an unprecedented opportunity to study both the life cycle of quasars and the galaxies that they once called home. A quasar arises from a distant (and therefore, very old) galaxy that once contained a central, rotating supermassive black hole – what astronomers call an active galactic nucleus. This spinning beast ravenously swallowed up large amounts of ambient gas and dust, kicking up surrounding material and sending it streaming out of the galaxy at blistering speeds. Quasars shine because these ancient jets achieved tremendous energies, thereby giving rise to a torrent of light so powerful that astronomers are still able to detect it here on Earth, billions of years later. In their hey-day, some active galactic nuclei were also energetic enough to excite electrons farther away from the central black hole. But even in the very early Universe, electrons couldn’t withstand that kind of excitement forever; the laws of physics don’t allow it. Eventually, each electron would drop back down to its rest state, releasing a photon of corresponding energy. This cycle of excitation happened over and over and over again, in regular and predictable patterns. Modern astronomers can visualize those transitions – and the energies that caused them – by examining a quasar’s optical spectrum for characteristic emission lines at certain wavelengths. Not all quasars are created equal, however. While the spectra of some quasars reveal many bright, broad emission lines at different energies, other quasars’ spectra consist of only the dim, narrow variety. Until now, some astronomers thought that these variations in emission lines among quasars were simply due to differences in their orientation as seen from Earth; that is, the more face-on a quasar was relative to us, the broader the emission lines astronomers would be able to see. But all of that has now been thrown into question, thanks to our friend J015957.64+003310.5, the quasar revealed by the team of astronomers at Yale. Indeed, it is now plausible that a quasar’s pattern of emission lines simply changes over its lifetime. After gathering ten years of spectral observations from the quasar, the researchers observed its original change in brightness in 2010. In July 2014, they confirmed that it was still just as dim, disproving hypotheses that suggested the effect was simply due to intervening gas or dust. “We’ve looked at hundreds of thousands of quasars at this point, and now we’ve found one that has switched off,” explained C. Megan Urry, the study’s co-author. How would that happen, you ask? After observing the comparable dearth of broad emission lines in its spectrum, Urry and her colleagues believe that long ago, the black hole at the heart of the quasar simply went on a diet. After all, an active galactic nucleus that consumed less material would generate less energy, giving rise to fainter particle jets and fewer excited atoms. “The power source just went dim,” said Stephanie LaMassa, the study’s principal investigator. LaMassa continued, “Because the life cycle of a quasar is one of the big unknowns, catching one as it changes, within a human lifetime, is amazing.” And since the life cycle of quasars is dependent on the life cycle of supermassive black holes, this discovery may help astronomers to explain how those that lie at the center of most galaxies evolve over time – including Sagittarius A*, the supermassive black hole at the center of our own Milky Way. “Even though astronomers have been studying quasars for more than 50 years, it’s exciting that someone like me, who has studied black holes for almost a decade, can find something completely new,” added LaMassa. The team’s research will be published in an upcoming issue of The Astrophysical Journal. A pre-print of the paper is available here. We know dark matter exists. We know this because without it and dark energy, our Universe would be missing 95.4% of its mass. What’s more, scientists would be hard pressed to explain what accounts for the gravitational effects they routinely see at work in the cosmos. For decades, scientists have sought to prove its existence by smashing protons together in the Large Hadron Collider. Unfortunately, these efforts have not provided any concrete evidence. Hence, it might be time to rethink dark matter. And physicists David M. Jacobs, Glenn D. Starkman, and Bryan Lynn of Case Western Reserve University have a theory that does just that, even if it does sound a bit strange. In their new study, they argue that instead of dark matter consisting of elementary particles that are invisible and do not emit or absorb light and electromagnetic radiation, it takes the form of chunks of matter that vary widely in terms of mass and size. As it stands, there are many leading candidates for what dark matter could be, which range from Weakly-Interacting Massive Particles (aka WIMPs) to axions. These candidates are attractive, particularly WIMPs, because the existence of such particles might help confirm supersymmetry theory – which in turn could help lead to a working Theory of Everything (ToE). According to supersymmetry, dark-matter particles known as neutralinos (aka WIMPs) annihilate each other, creating a cascade of particles and radiation. Credit: Sky & Telescope / Gregg Dinderman. But so far, no evidence has been obtained that definitively proves the existence of either. Beyond being necessary in order for General Relativity to work, this invisible mass seems content to remain invisible to detection. According to Jacobs, Starkman, and Lynn, this could indicate that dark matter exists within the realm of normal matter. In particular, they consider the possibility that dark matter consists of macroscopic objects – which they dub “Macros” – that can be characterized in units of grams and square centimeters respectively. Macros are not only significantly larger than WIMPS and axions, but could potentially be assembled out of particles in the Standard Model of particle physics – such as quarks and leptons from the early universe – instead of requiring new physics to explain their existence. WIMPS and axions remain possible candidates for dark matter, but Jacobs and Starkman argue that there’s a reason to search elsewhere. After eliminating most ordinary matter – including failed Jupiters, white dwarfs, neutron stars, stellar black holes, the black holes in centers of galaxies, and neutrinos with a lot of mass – as possible candidates, physicists turned their focus on the exotics. Nevertheless, matter that was somewhere in between ordinary and exotic – relatives of neutron stars or large nuclei – was left on the table, Starkman said. “We say relatives because they probably have a considerable admixture of strange quarks, which are made in accelerators and ordinarily have extremely short lives,” he said. Although strange quarks are highly unstable, Starkman points out that neutrons are also highly unstable. But in helium, bound with stable protons, neutrons remain stable. “That opens the possibility that stable strange nuclear matter was made in the early Universe and dark matter is nothing more than chunks of strange nuclear matter or other bound states of quarks, or of baryons, which are themselves made of quarks,” said Starkman. Such dark matter would fit the Standard Model. This is perhaps the most appealing aspect of the Macros theory: the notion that dark matter, which our cosmological model of the Universe depends upon, can be proven without the need for additional particles. Still, the idea that the universe is filled with a chunky, invisible mass rather than countless invisible particles does make the universe seem a bit stranger, doesn’t it?